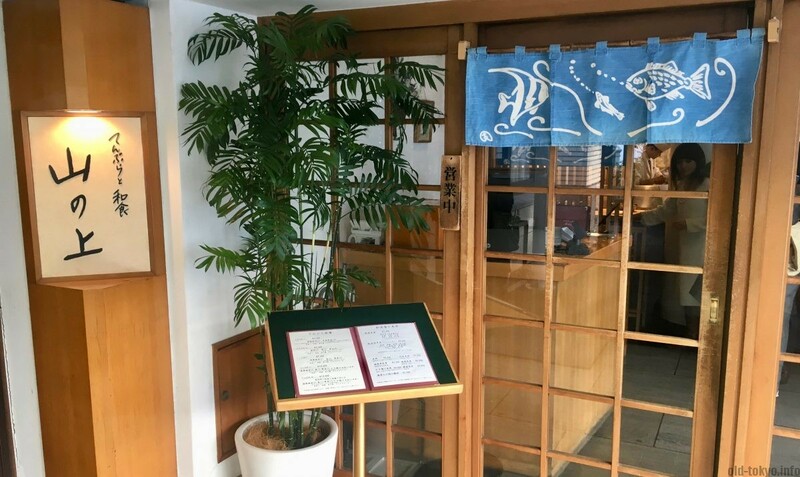 Yama-no-ue is an upscale tempura restaurant started by chef Toshio Yoshida, who opened the tempura restaurant in the classical-style Hilltop hotel in 1954 in Ochanomizu (central Tokyo, right next to Akihabara). At that time Yoshida had already 30 years of experience. 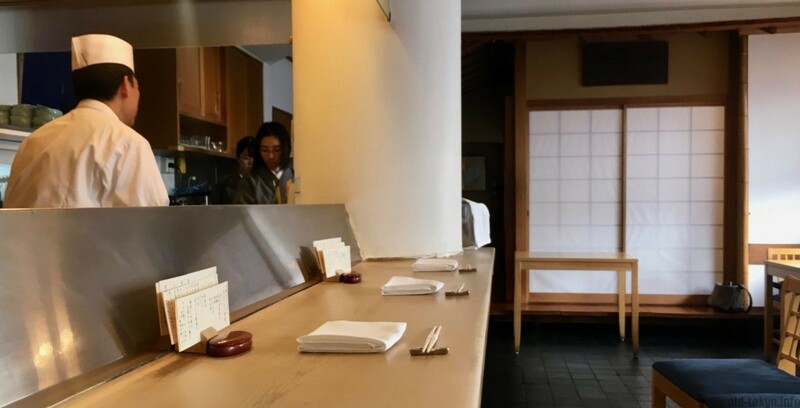 The restaurant grew in popularity while Fumio Kondo was the head chef in the 1970s and 80s, who now runs the 2 star Michelin restaurant Kondo Tempura and is one of the most popular tempura chefs in Japan. It is said that during his time at Yama-no-ue, tempura became a Japanese food that could stand the competition against sushi. Entrance to the restaurant in the hotel, it is located on the right hand side if you enter the hotel through the main entrance. There is a separate side entrance as well. 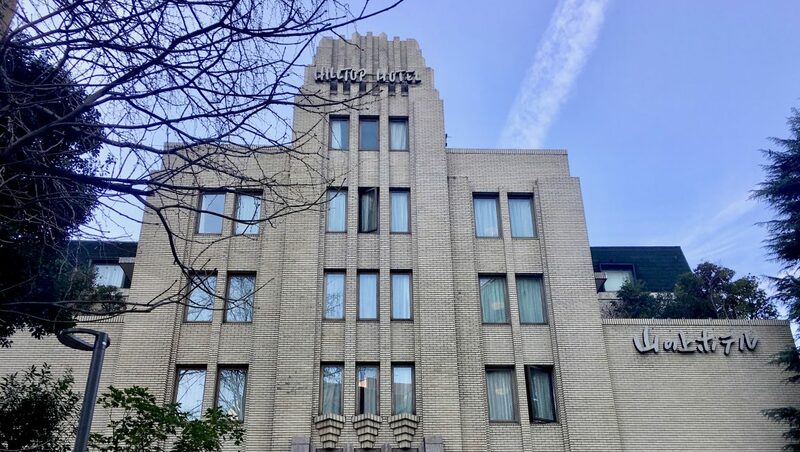 The hotel is pretty small, with only 35 rooms, and quite famous, playing host to big names in Japanese literature such as Yukio Mishima (1925-1970). It is a hotel not very known among foreigners in Tokyo, but ask any Japanese (from Tokyo) and they surely know about it. It is housed in a building originally built in 1936, with very characteristic stepped-gable facade (see photo at the top of this article). The hotel has 7 restaurants and bars, a lot in comparison to how few rooms are available. Yama-no-ue developed into a small chain of 4 restaurants, but it holds value to visit the original in Ochanomizu as this is where chef Kondo perfected the food now to be found at most fine tempura establishments in Japan. This tempura restaurant is also the first one ever that was established inside of a hotel. The other Yama-no-ue restaurants can be found in Ginza, Roppongi and Nihombashi. Yama-no-ue did not disappoint in providing me with excellent crisp piping hot tempura, a good variety of seasonal fish and vegetables. I read that it was chef Kondo who introduced vegetables on the menu during his time as head chef. The original Kanto-style tempura focused on fish, but he made it possible to introduce vegetables on the menu as well. For example, he introduced green asparagus, now a mainstay at most fine dining tempura restaurants. My course started with the fried head of a Japanese tiger prawn (kuruma-ebi), simply delicious. Then the items of the course came one by one. I took the ro course for lunch, consisting of 2 shrimp, 3 fish and 5 vegetables. At the end of the course rice, tsukemono (pickles) and miso soup was served. As dessert they had a simple scoop of ice cream (green tea or apple sorbet). Next to the prawn head and green asparagus, the highlight for me was the onion, something I never had before. This was a whole onion fried, then cut in half. Also the goby fish (haze), eggplant (nasu), lotus (hasu) and eel (anago) were great. Yama-no-ue serves Edo-style tempura (hereafter called Kanto style as it is generally known), as opposed to the Kansai-style (region of Osaka and Kyoto). 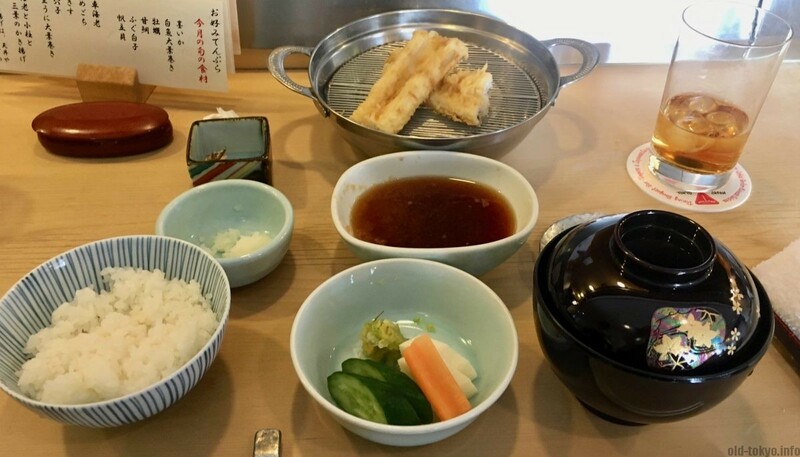 It appears that this difference between the different styles of tempura is not common knowledge, despite the frequency with which tempura is eaten and the multitude of tempura restaurants in Tokyo. However, every restaurant has developed their own style nowadays and I have a strong feeling that chef Kondo has greatly changed the original taste. 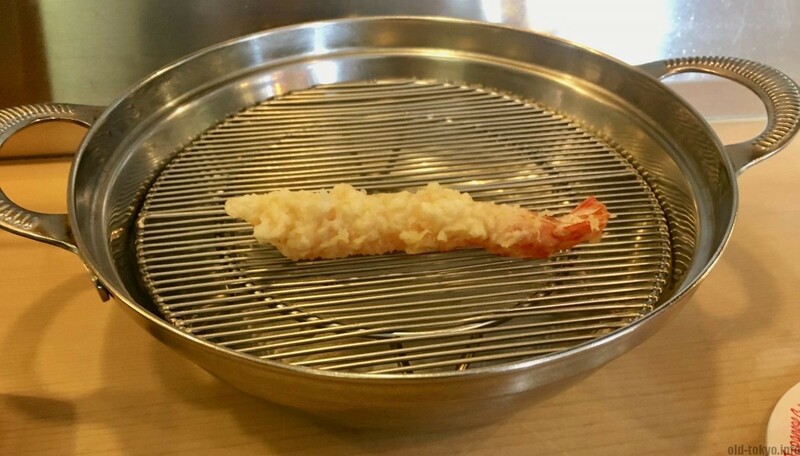 If you look for example at the color of the tempura it goes more in the direction of white than yellow, which would place this tempura in between Kanto and Kansai styles. The main difference between the 2 styles is that for Kanto-style tempura sesame oil is used, while for Kansai-style a more neutral oil is used, usually just a generic vegetable oil. 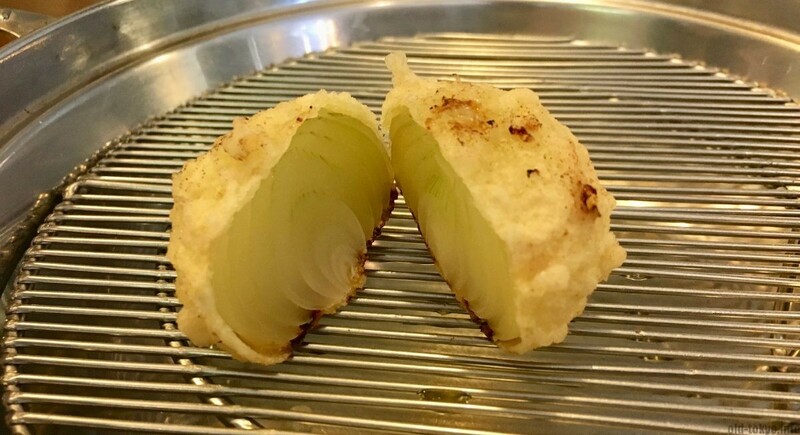 Another big difference is that egg is used in the batter of Kanto-style tempura, while in the Kansai-style no egg is used. This makes that the Kanto-style tempura looks more yellowish, in comparison to the Kansai-style that appears more whiteish. Another less obvious difference is that the temperature of frying in Kanto is higher than in Kansai. However, last time I ate Kansai-style I found the tempura to be similarly hot, as they bring it to your plate right after it has been fried. Sesame oil is used in Kanto for a good reason as in Kanto a lot of fish is used and the sesame oil removes any possible bad smell. There is also a small difference in the way of eating. While both styles use the same dipping sauce (tentsuyu: a light sauce that offsets the oil, made with mirin, shoyu and dashi; you can add in here grated daikon according to your taste), it is said that in particular in Edo the tempura was served piping hot, after which you cool it down in the dipping sauce. Salt is used in both styles, but it is rather the Kansai-style that prefers the slight seasoning of salt as in Kansai they mostly fry vegetables. Regardless of the precise style, the tempura at Yama-no-ue left me satisfied. I look forward going again. Dinner 17:00-21:00 (21:00 is the time of your last order, which means you can still stay for quite some time). In weekends dinner service starts from 15:00.